This is not what you think it is! This is not your favorite MAXIM Magazine. This is the MAXIM Philippines Operating Corporation, an IT/Semiconductor Company located at the Gateway Industrial Park in General Trias, Cavite. Tom Mark Obach, Chief of the Test System Support & Services of the Company and President of the Team Maxim Runners, sent me an e-mail two months ago requesting me to conduct a lecture & clinic to the personnel of the company. The lecture was initially scheduled last month but due to conflict of schedule on the part of the officers of the company’s running club, it was rescheduled for this month. After some exchange of e-mails and coordination, the lecture was finally implemented. The Elite Team BR and I were fetched by Tom and company at The Fort on the morning of Saturday, June 19, 2010 for a two-hour trip to General Trias, Cavite. We arrived at the company’s ground before noontime. 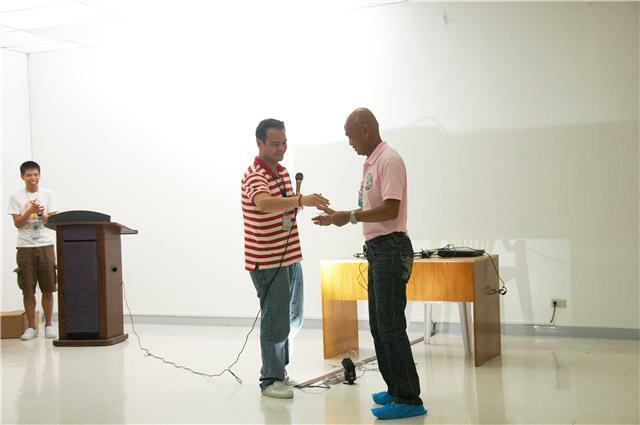 After the usual inspections and clearance protocol by the security personnel, we were escorted to the lecture area. The Team Maxim Runner officers were very hospitable as they served us with a sumptous lunch, complete with vegetable salad and lots of rice. They really prepared for the practical side/clinic of the activity. The lecture started at exactly 1:00 PM and the audience was attentive with the lecture and presentation. An open forum was conducted after the lecture and also gave them tips on hydration, nutrition, shoes, training, safety/etiquette, and techniques in road races. The lecture was followed with an actual demonstration of stretching exercises led by the elites. The audience were requested to follow what the elites had demonstrated. The stretching exercises were followed with running “drills”. 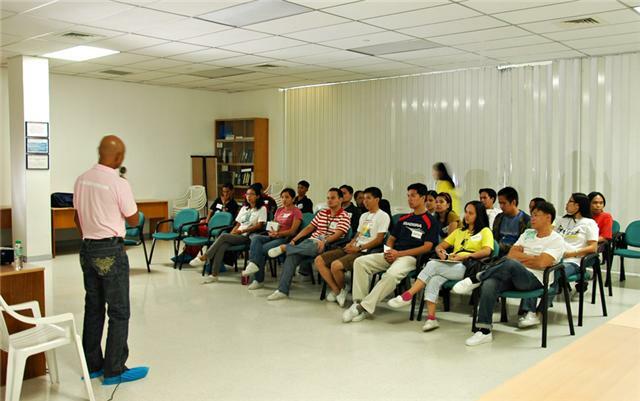 It was good that the lecture room was spacious that everybody was able to do the suggested running “drills”. I received feedbacks that it was their first time to know the stretching exercises and the running “drills” that the elites have demonstrated to them. After one hour of stretching exercises and running “drills”, we ended the activity with snacks together with the Team Maxim Runner! Before 5:00 PM, we left the Company’s grounds and we were on our way back to The Fort. Because of the strong rains and traffic along the way, we finally reached The Fort at 7:30 PM. The Elite Team BR and I would like to express our thanks for the hospitality of the Team Maxim Runner led by Mark Tom Obach, Alex Amores for sending the pictures & for being the official photographer of the event, and to the rest of the officers and members. Thank you also for the “memento” as your donation to the Elite Team Bald Runner. Thank you also for your plan to contribute to my Project Donate A Shoe. Hope to see you in future road races! Good luck & Stay safe always! It seems you’ve been into a lot of running clinic and lecture series lately. More power to you and your Elite Team BR, Sir Jovie. 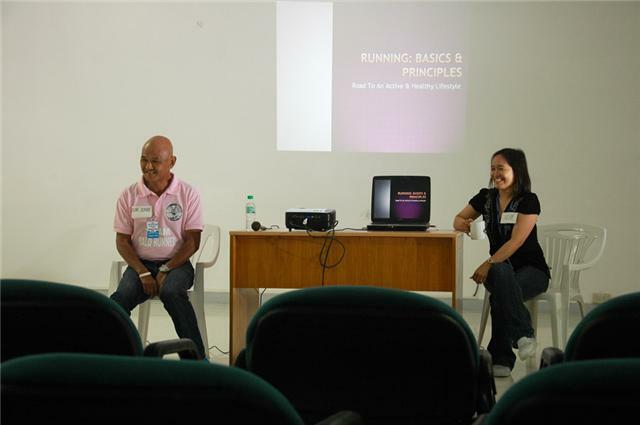 Sir Jovie is one of the most dynamic and avid running authority today. He’s a nice person, approachable and ready to pose for a picture :). Sir, you’re one of the reasons why I got this far into running. We’ve met a couple of times during a running gig and I can still remember what you said: JUST RUN! – and i haven’t forgotten that. In fact, it’s one of the mantras I will carry with me during the Milo Marathon on July 4. 🙂 BR nice yun picture with shadows. congratulations on another successful running clinic.